I am a percussionist who studied at the Royal Academy of Music. I was classically trained as well as learning drum kit and all forms of percussion at the academy. I have a pacific CX drum kit and a Roland V Drums TD20. As a teacher of drum kit I like to adjust my teaching style and resources according to the students needs and wishes. This could be using the grade system or simply working through song structures and learning music that the student enjoys. * PAY NOTHING NOW * Payments for drum lessons are made directly to James Bower. 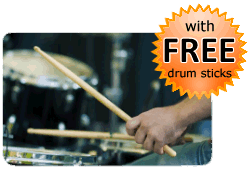 You do not pay in advance to book a drum lesson with James Bower via this website. The Booking Request Form on this page enables James Bower to get in contact with you to confirm a day and time for the drum lesson.